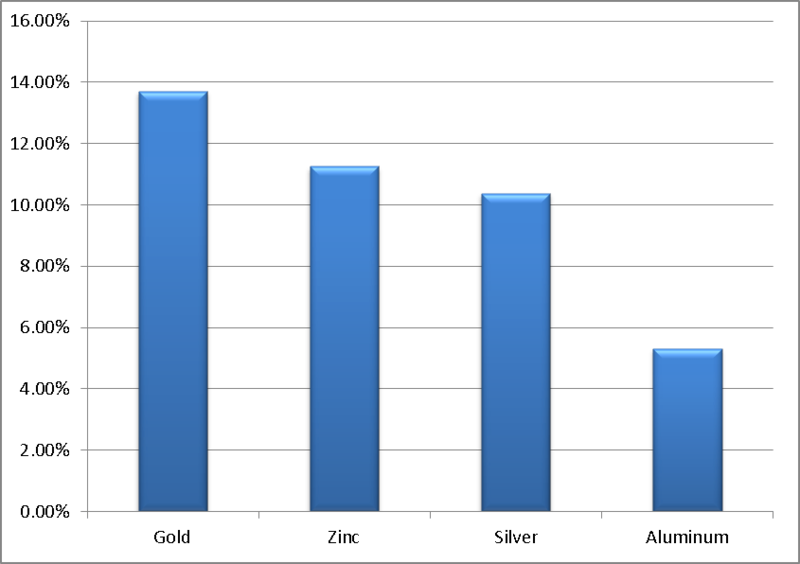 Precious and Industrial metals alike have been in a continued decline for various years now. Excess supply created by the massive rally in commodity prices that took place after the 2008 crisis. A weakened demand since the height of the commodity boom, are the two primary factors that have been driving price down. The start of the year has seen a continued glut of energy products and most other commodities. However, some metals have had a remarkable performance which may show the beginning of a turn in trend. Gold has been the top performer since the start of the year amongst metals as well as most other major liquid assets. The shiny yellow metal has risen 13.70% since the beginning of the year; Zinc comes in second at 11.25%, Silver and Aluminum have increased by 10.37% and 5.31% respectively. The main factor driving the price of Gold is the market turmoil and volatility that begun the year. The stock market rout was sparked by recession fears in the world’s second-largest economy China, and concerns of a slower than forecast recovery in Europe. As always, in times of market stress, investors turn to the main safe haven of Gold. At some point, rising interest rates had been a factor for continued downward pressure. But the markets have since absorbed the pressure created by higher coupon paying assets such as bonds. Right now risk is perceived as great, and there may only be one place to hide. 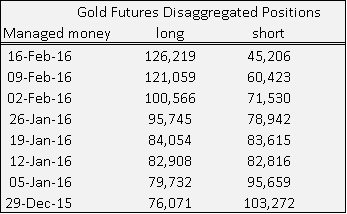 The table below shows the commitment of trader’s reports for the past 7 weeks of Long and Short Gold position in Futures. I took the figures for managed money as these accounts are the ones that are speculating on the next move for Gold. The Long positions for managed money in the space of seven weeks goes from being 27,201 contracts less than short positions, to being 81,013 lots more. This increase of Long positions has matched the sharp rally in Gold price over the same period. Similar factors may apply for Silver although it is not always the first choice for most investor looking for a safe place to store wealth. Zinc and Aluminum are industrial metals that have seen a refreshed demand. Zinc is used in many industrial applications and most notably in lithium batteries which are used in smartphones. But there have also been rising possibilities that the supply glut may be coming to an end. The last weeks of 2015 saw increased imports from China and two large mines coming to the end of their extraction lives. Aluminum has also found new favor in many industries and is also the material used to make Tesla cars. Its performance has not been as strong as the other three, but when considering the whole spectrum of commodities it still looks attractive. The chart below shows the performance of the four metals mentioned above compared to Stocks and Equity REITs since the beginning of the year. ETFs that invest in these single commodities are probably the best bet to gain exposure. For Gold and Silver the two largest ETFs are SPDR Gold Trust (NYSE: GLD) and Silver Trust (NYSE: SLV). For Nickel there are not so many choices; It basically comes down to an ETN issued by Barclays iPath, (NYSE: JJN) This fund tracks the Dow Jones-UBS Nickel sub-index and invests in futures, which may allow for Roll Return on top of price return. The same type of choice is available to gain exposure with an ETN issued by Barclays iPath (NYSE: JJU) this one tracks the DJ-UBS Aluminum sub-index. It has had a YTD of 3.8%; again this fund invests in futures, which simplifies your life by avoiding you the need of setting up futures accounts or performing successive roll-overs of futures contracts to be able to track the index. Hedge Funds as an asset class, since the start of the year, have also performed poorly, the Credit Suisse hedge fund index reports a yield to date of -1.41%. That is better however than the broader stock market. The S&P 500 has lost 5.72% since the beginning of the year. Volatility in the stock markets doesn’t seem set to settle down anytime soon either. There are just too many uncertainties; will interest rates in the US continue to rise? And possibly suffocate a continued economic expansion. Does the US still have the momentum for sustained economic growth to begin with? Will China finally return to higher levels of economic activity? Of the type we have seen in past years.